A $94 value! The KB crew pack has all the essentials you need. 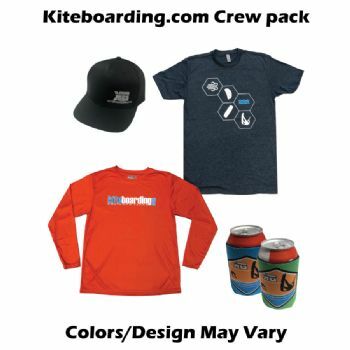 Our specially trained color expert will pick out the right mix to make sure you look great while showing off your KB Crew gear! Just pick your size and leave the rest to us. Kiteboarding.com Logo Hat - The FlexFit hat just landed the KB logo. Breathable mesh back and light weight design makes this the perfect hat for keeping the sun off your head and out of your eyes on sunny days. The Shirt is designed and printed in the USA.